If you read my end of the year survey, the books on this list will be no surprise to you. While I read plenty of great books this year, I decided to only list the six that I can't stop thinking about or recommending to people. 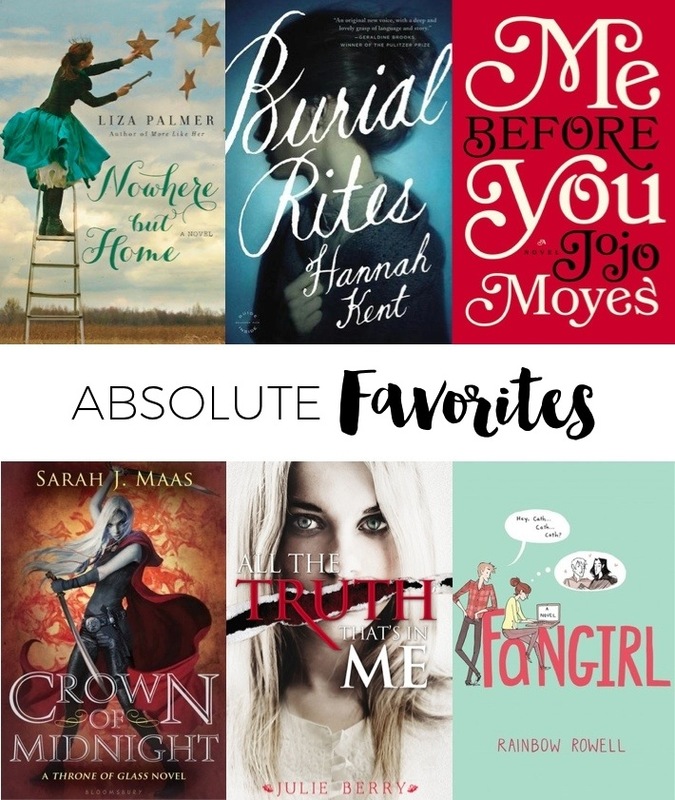 These were all five-star reads for me, and I've quoted from and linked to my reviews for each (just in case you need further convincing to read these books). I loved Fangirl, too. I am in awe of Rainbow Rowell. But then we seem to be in the majority. Everyone is mentioning her. It was definitely the year of Rainbow! I've seen All The Truth That's in Me on a lot of lists this week. It's making me curious. And of course Fangirl was tops on my list this year. I loved that book so hard!!! Hope you read that one - Berry's book was amazing! Haha! I was shocked I restrained myself to just six :) And yayyyy Liza! I've only read Fangirl, but I loved it so much! Rainbow Rowell is definitely the author of the year for me. I loved all three of her books, but Eleanor & Park is my favorite (by only by a slight margin). I have Burial Rites on my Kindle and I keep meaning to get to it - you definitely have me wanting to start it right now! Oh yay! That book is absolutely GORGEOUS. I'm happy you're pushing All the Truth That's In Me, too. I really need to read Nowhere But Home and Burial Rites because I constantly see you pushing them :) Happy New Year!! Yay for book pushing All the Truth That's In Me! And pleeeease read the other two - or Nowhere But Home at the very least. They are both such great reads! Me Before You and Fangirl are everywhere on these lists. Apparently, I've really missed out this year! Burial Rites is one of my absolute favorite books of this year, too. And I haven't read Fangirl, but I loved Eleanor & Park and hope to read it in 2014! Hooray! I'm so happy that you loved Burial Rites, too. Such an incredible read! And I can't wait for you to read Fangirl. Sooo good! I'm hoping to get to Crown of Midnight this year - I've seen it on quite a few lists. It's so great! I thought it was even better than ToG! I could barely narrow my list done to 10 books. Its hard to believe you only had 6. Fangirl is a book I hope to read next year. Crown of Midnight has been on so many people End of the Year survey and top favorite books that I might have to give that series a try. Hahah I loved a lot more than 6 books this year, but I made myself stick with the very top of the list of favorites. And hope you do read ToG and CoM - both are awesome! Great list. You've got some really amazing books on your list - I really enjoyed All The Truth That's In Me when I read it. I really want to read Fangirl, have heard nothing but amazing things. Happy New Year :) My TTT. I'm totally cheering about the fact that Crown of Midnight is on this list, mostly because I'm a Chaol fangirl and it makes me happy you loved him - I mean, the book he's in ;) I also really enjoyed Fangirl (super cute, super fun to read, and super relatable) and Me Before You (which made me tear up). I totally need to read Nowhere But Home this year, and Burial Rites, too!